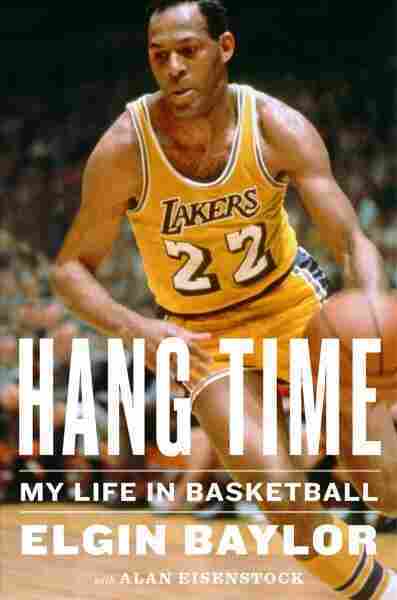 Elgin Baylor's 'Hang Time' Addresses Racism And His Basketball Career Throughout his life, legendary basketball player Elgin Baylor suffered through many racial indignities, which are detailed, along with his career, in his book, Hang Time. 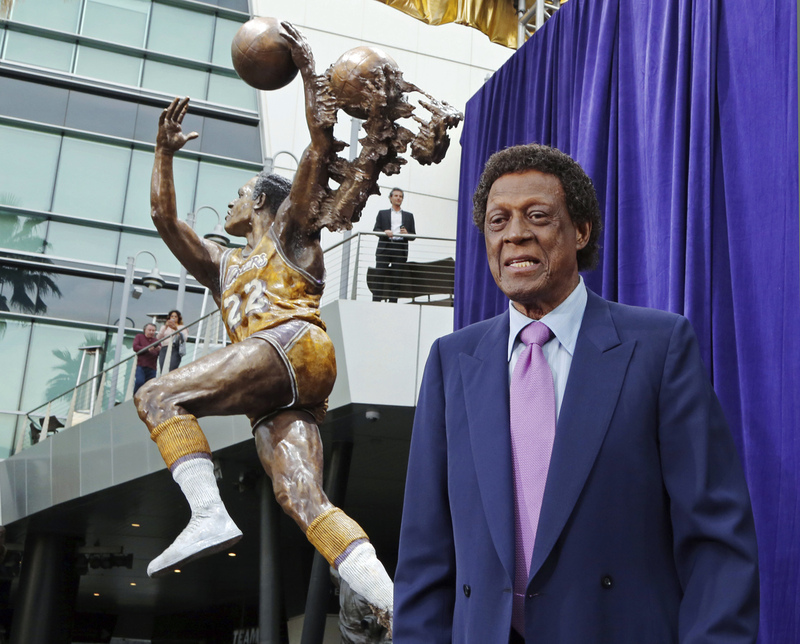 Elgin Baylor stands next to a statue honoring the Minneapolis and Los Angeles Lakers players, outside Staples Center in Los Angeles on April 6. Before LA Laker greats like Kobe Bryant, Shaquille O' Neal, Kareem Abdul-Jabbar and Magic Johnson, there was Elgin Baylor. He was drafted in 1958 by the team before they were even the LA Lakers. They were still the Minneapolis Lakers, named for the lakes of Minnesota. He was the centerpiece of the team when they moved to California. Angelinos loved his freewheeling, acrobatic style. He took the Lakers to the finals seven times. His new book, Hang Time, is a story about basketball, but it's also about racism: when an athlete should or should not protest, a question relevant in sports today. For Baylor, an experience racism that informed his life later involved his sister, Columbia, older than Baylor by just about two years, and his father, in segregated Washington, D.C. Baylor and his sister, then 13, were walking home from school when a white girl spit on her and called her the "n" word. Columbia slapped the girl, then walked home. The police came to the Baylors' house to arrest Columbia for assault. Her father pleaded with them not to. So the cops said he should punish her – and, Baylor writes, even suggested what to use to whip her. His father did as they said, using a leather strap to beat his daughter in front of a young Elgin. The beating and the way the police treated his sister and his father have haunted him ever since. "For me, I didn't think she did anything wrong, and I was just wondering why my dad punished her," Baylor tells NPR's David Greene. He was reminded of the incident in 1959, after a Charleston, W.Va., hotel refused to let him and some of his black teammates check in. In the book, he writes that later that day as he prepared for a game against the Cincinnati Royals, he was angry and felt just as he did after that childhood incident with the police. "Nothing makes sense. Nothing matters. I feel so small. I feel so ... dismissed," he writes. 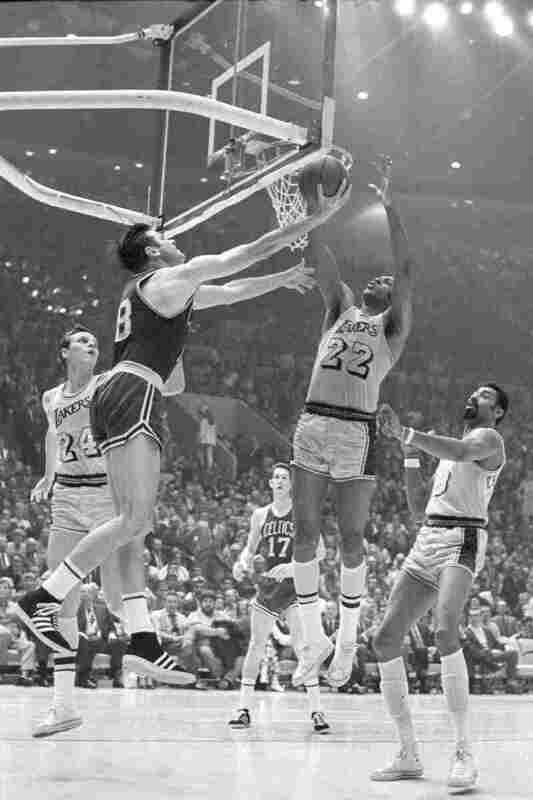 Elgin Baylor (right) of the LA Lakers blocks a reverse lay up attempt by Boston Celtics' Bailey Howell in Los Angeles on May 5, 1969. So he decided to stage a protest. "I want to be treated like a human being. I'm not an animal put in a cage and let out for the show," he writes. He tells NPR it wasn't a hard decision to make. "I'm not being big-headed or anything like that. The first thing I said was I was really hurt by that and I thought about it and I said 'I'm not going out there. We're not like animals in the circus or something and then go out there and put a show on for them,' " he says. Baylor went on to play 14 years for the Lakers. He then spent some time as a coach, and as a broadcaster. He finished his career confronting racism again, working as general manager of the LA Clippers with team owner Donald Sterling. Sterling became infamous in 2014, when audio tapes revealing his racism went public. Sterling was banned from the league. But before that, Baylor worked alongside Sterling for 22 years, through 2008. Even though he knew his boss was a racist, he stuck it out. "Now if you think about it yeah, I regret working with Donald. The thing about it – you're married, you have a family ... so you have to have a job," he tells NPR. The sportswriter Bill Simmons once speculated that Baylor's affiliation with Sterling and the Clippers might have tainted the way fans remember his legendary career. Baylor doesn't think that's fair. And apparently the Lakers don't either. They recently unveiled an Elgin Baylor statue out front of Staples Center, where the Lakers play — alongside Johnson, Abdul-Jabbar and O'Neal. A previous headline misspelled Elgin Baylor's name as Eglin Bayor.